I hope everyone had a fantastic weekend! We had a great time with friends and family, watched some movies (highly recommend seeing The Neighbors especially if you’re new parents. And holy Zac Efron! Toto, I’ve a feeling we’re in High School Musical anymore…), celebrated a first birthday, and of course last night’s Heat win! So I know you all (and myself) enjoy a great value set of makeup must-haves (did you all order Sephora’s Summer Crushes that I spoke about last week??) 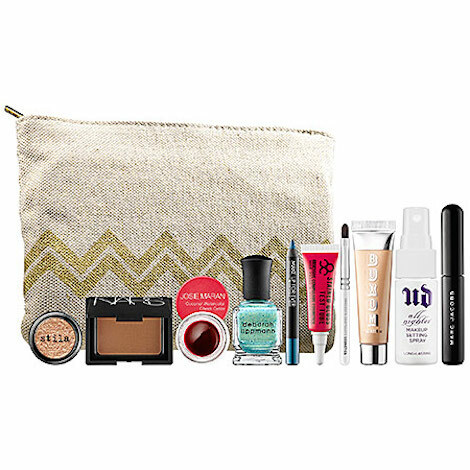 so I wanted to share another Sephora Favorites set specific for summer, Summerstash. For $45 you get the following nine sample-size products geared to get you looking hot in the heat! 0.049 oz Stila Cosmetics Magnificent Metals Foil Finish Eye Shadow in Kitten: Looks like so much fun to try on the lids! 0.08 oz Nars Travel Size Laguna Bronzing Powder: A cult classic! 0.095 oz Josie Maran Coconut Watercolor Cheek Gelee in Pink Escape: Been dying to try this! 0.27 oz Deborah Lippmann Nail Lacquer in Mermaid’s Dream: If you’re feeling a little wild! 0.018 oz Make Up For Ever Aqua Eyes Waterproof Eyeliner Pencil in 12L: How fun is this shade?! 0.08 oz Obsessive Compulsive Cosmetics Stained Gloss in New Wave with Lip Brush: Obsessed with this color! 0.23 oz Buxom Divine Goddess Luminizer in Venus: Love that they include this in the set since it’s currently sold out! 0.5 oz Urban Decay All Nighter Makeup Setting Spray: Perfect for hot and humid summer nights! 0.09 oz Marc Jacobs Mini Lash Lifter Mascara in Blacquer: Oh hello luxe new mascara! Be sure to check it out before they’re all gone!